I first felt adult when I set up my first Registered Retirement Savings Plan. I guess that says a lot about me. It wasn’t when I passed my driver’s test. It wasn’t when I cast my first vote. It wasn’t when I could legally drink. In my mid-20s and in my first real job I knew I didn’t want to be one of those grannies who subsist on tea and toast, with only the government pension scheme keeping me off the streets. Setting up an RRSP seemed like right thing to do to better fund a retirement which was decades away. Retirement is still decades away and despite my best efforts, other moments keep my maturity needle keeps edging towards adulthood. Grown-up moments in my kitchen have been known to happen. In as practical a matter as cooking is, I simply love to clatter pots and pans and will roll up my sleeves and do what’s necessary. No fanfare. No melodramatic noises. I know not everyone is comfortable with dismembering a bird or resurrect the Spanish Inquisition when heating up a vat of oil for deep fat frying, but these bits of business are regular occurrences in my kitchen. That’s not to say I don’t celebrate scaling my own Everests. Whether it was my first caramel that didn’t turn into a crystallised charred glob or creating a pastry that doesn’t make one wax lyrically about boot leather, these accomplishments are quietly celebrated and reinforced whatever culinary acumen possess. Earth-shattering? No. Nobel or James Beard Prize-winning? Not in the slightest. Moments that forward my kitchen’s progress? Yes. 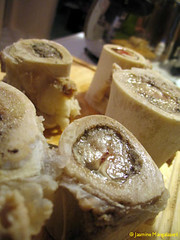 My most recent maturing moment came when I had to extract marrow from beef bones. The oleophobic and hemophobic, squeamish about biological bits of kitchen work may simply want to turn away now. To remove marrow from beef bones, a bit of exsanguination must take place. 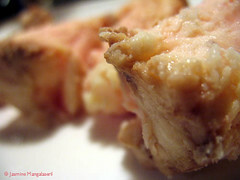 Scooping it from an unsoaked bone will result in globules of cooked blood in your finished dish. You may or may not care, but for my usage, I had no inclination to dig into a dish, splattered with greyed brown. Down to business To remove the blood from the bones, cover the bones in saline ice water solution (two tablespoons of salt mixed into the water) and refrigerate for 12-24 hours. Completely change the water every three or four hours, replacing the pinkish solution with increasingly salty water, adding more two tablespoons of salt to each saline solution (the first change will have four tablespoons of salt, the third, six tablespoons, etc). At the end of the process, remove the soaked bones to a pan of simmering, salted water. Simmer them, uncovered for about 5-10 minutes, or until the marrow just loosens from the bone. Removed to a paper towel-lined plate and let sit until cool enough to handle. With the aid of a paring knife, loosen the marrow from the bones and push the fatty pieces into a bowl of icy water. 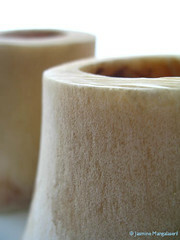 You can refrigerate the marrow until you need to use it. And that’s all that was needed for this rite of passage. I'm a quill for hire! Yes you are a big girl now. Cant wait to see what didh you used this for. Or you could smear on toast. Wow, impressive! I've always loved eating the marrow in stews like osso bucco, and I enjoy ordering marrow bones ("os à Moelle") in French restaurants, but I've never extracted marrow. Thanks for sharing the "secret technique"! Wow, I might be older.. but you are way more grown up than I am - brave girl! Great work! Thats an accomplishment worth remembering. I just bought some bones with marrow the other day, for no reason, but I felt like I needed to do something with them. Your post has helped out a great deal! YUM, YUM, YUM - love marrow, but have never made it at home. Thanks for the tutorial. That is the best bone picture ever... so grand and imposing...great post too! This is a very interesting technique, never heard of before. In Lebanon, the sell the marrow by the kilo, and i ate lamb marrow before, sauteed with garlic and lemon juice, and when i use the bones i cook them completely in the pressure cooker to clean everything and make a good broth. I love this post! Soon I'll build up the guts to make some Osso Buco and this was a very informative read. Thanks, and by the way, I'm addicted to Cardamom too. In fact, I'm drinking some in my coffee right now! 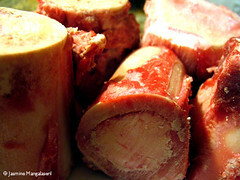 A very different method for removing marrow from beef bones. Your photos are also great. Thanks. food enthusiast | freelance culinary writer | effervescent aspiring polymath | I'm neither a chef nor a nutritionist; I'm just someone who enjoys the pleasures of food. These thoughts, opinions and statements are mine, not my employer's or my clients'. More importantly, these thoughts, opinions and statements have not been bought, traded or bartered for or otherwise coerced with fleeting promises of fame, fortune or popularity. Seriously. © 2005-2017. All rights reserved. Please don't steal my work; my lawyers have sharp teeth. Simple theme. Powered by Blogger.